Too many men. Not a good look for Bruins. 35 second 5-on-3 coming up for the #RedWings as the #Bruins are caught with an extra player on the ice. Assessment on Brendan Smith: Bruins fans hate him. Bruins beat writers love him. He's a quote/storyline machine. Marchand back on the ice, but headed for the box, as he's called for holding DeKeyser's stick. PP coming up for the #RedWings. Penalty on the Bruins Marchand. First penalty kill attempt for Boston tonight. Brad Marchand was back on the ice, that is. Now he's in the penalty box. Marchand returns. Probably just shaken up. Brad Marchand is back on the ice. Lucic is officially Enemy No. 1 ... Every time he touches the puck he gets booed. That was a knee from Brendan Smith, who goes to the penalty box. Only showed us one replay of the hit. Brendan Smith gets two minutes for tripping Marchand. Marchand has to be helped off the ice. Fans, of course, are less forgiving. Marchand to the dressing room. Brad Marchand is down. Still kneeling on the ice. Now helped off by Iginla/trainer. Red Wings fans not happy with Marchand going to the ice. I guess they think he's faking it. #Bruins didn't score on the PP, but got a ton of chances. 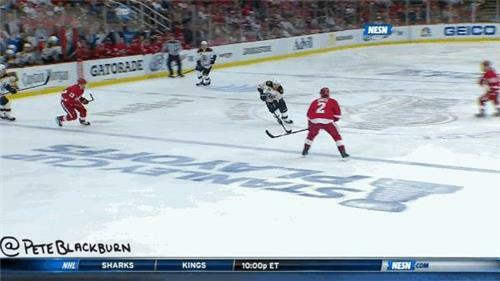 Best chance by Reilly Smith, but he fired it over the net. Bruins now 3 for 7 on the power play in the postseason. Of course the hit on Lucic gets the biggest cheer. Right now, the Bruins are 50 percent on the power play in the playoffs. Tatar two minutes for holding. We're back for the second period. Let's see if the Red Wings are awake. Nyquist's shot in first period, the only one by a Red Wing, came at 17:30. Puck about to drop for Period 2. Add assist on Boston's 1st goal.